Motorcycle-Blog is a blog I occasionally read through. I like motorcycles, not as much as cars, but enough to read about them on a regular basis. What's interesting is that Harley-Davidson is having lower than expected earnings and Wall Street promptly punished them by having their stock price fall somewhat. They still however make a profit. What does this have to do with cars? Well I see some similarities in Harley's predicament with the American auto industry. Harley's are known for brash looks, poor handling, a lot of power. This description characterizes a great deal of American cars, or at least the stereotype of American cars and SUVs. But even so, Harley sells outrageous amounts of bikes here and abroad, and they outsell even the powerful Honda in the US. Harley is really the only substantial American manufacturer of motorcycles, others are just expensive small enterprises. The Big 3 could learn a lot from Harley. Like them, Harley has been through rough times, and has faced bankruptcy. They made bikes at one time that no one wanted, and have always faced steep Japanese competition. Their bikes are generally considered less reliable, and worse handling than European and Japanese competition. Yet their bikes are usually the most expensive in their class, and sell for a larger profit. Like GM, their attempts at making high end classy vehicles are successful (Harley's V-Rod, GM's Corvette). So the empirical evidence that a company can sell an inferiorly handling, riding, and reliable vehicle versus Japanese manufacturers is evident. Harley is in no danger of going bankrupt, and makes an enormous profit selling in Europe and Japan where are weak currency increases that margin tremendously. They also dare not ship any manufacturing jobs overseas lest they lose customer support. The Big 3 have the exact opposite of problems because they don't make vehicles that evoke their companies' traditions. Harley is all about tradition, and the result has been great success. [Ford] had been preparing for the shift away from SUVs to more fuel-efficient crossovers and passenger cars and the automaker has invested in the company's future rather than boosting short-term profits. GM's analysis of fuel availability suggests oil prices should level off at "$40 or $50 a barrel," Wagoner said. "And all of our research says, at that level, people are going to go buy a lot of large utilities. I think that's a pretty good bet to make." At a Morgan Stanley event last month in New York, GM Vice Chairman Robert Lutz told analysts and investors the large SUV segment is strong. "It's a large and steady market with more than 650,000 affluent, attractive customers," Lutz said. Umm, but it's a market that is DECREASING ACROSS THE BOARD. So basically the heads of GM and Ford are doing the EXACT opposite of each other in the face of the same challenge, rising fuel prices. What does that mean? It means that only one of them will be right if fuel prices go up, which it seems they will for the forseeable future. Who will be right? I have no idea, but I sure do have an opinion. Hint: His last name begins with an F.
Ford has some brilliant products in its corner. They've got the F-150, clearly the best looking big pickup out there, the new Mustang, and the upcoming Fusion. The Ford Escape hybrid is a great idea too. But then they do something silly like Autoblog details. They decide not to update one of their stalwarts, the Ranger. They'll argue of course that falling sales demonstrate that people are tired of that segment. But the falling sales coincide with the aging of the product. When I saw the new Honda Ridgeline, and realized that it was a larger sized pickup, I knew that Honda had messed up and had left a market niche ripe for the taking. 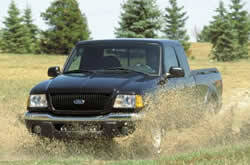 The small fuel efficient pickup truck market is dominated by Ford. But if the vehicle just sits there they're asking for trouble. They tried the same thing with the Crown Victoria, and it worked, for awhile at least. With the accidents that vehicle has suffered it won't be long before the Dodge Charger becomes the standard RWD car for police all over America. Aesthetics are so important. There is a minimum threshold for handling, reliability, price, etc. that most car makers meet, if not all of them. But it's the car makers that are bold aesthetically that do well. I can't tell you how many people are convinced that the Mazda 6 and 3 are "sportier" than their competition. In the case of the 6, it doesn't come in a coupe form, it has less horsepower than the Accord, and probably handles about the same. Why is it "sportier"? Because of the look. Simple as that. If you make something look "sporty" people will call it such. "Bloated", "slow", "ugly", are descriptions as well that a car can have. My point is Ford could go the extra mile by completely redoing the Ranger's look, give it 5 extra HP, and maybe 5 better miles per gallon, and you'd have a winner. It's really all about aesthetics.